Celebrities Are As Thrilled As Everyone Else About the Cubs’ World Series WinEverybody loves an underdog story. World Series Game 7 Offers a (Paranoid) Preview of Election NightHopefully the president won’t delay the election owing to rain. The Chicago Cubs Win the 2016 World Series of HuggingJust look at all those epic, winning hugs! History Will Be Made in Game 7 of the World SeriesOne long-suffering midwestern fanbase will finally have reason to cheer. Watch Eddie Vedder Sing at the World SeriesVedder succeeded in bringing good luck where Bill Murray and Vince Vaughn failed. Move Over, Bill Murray: Eddie Vedder Is Singing at the World Series TonightThis will be a very rockin’ seventh-inning stretch. 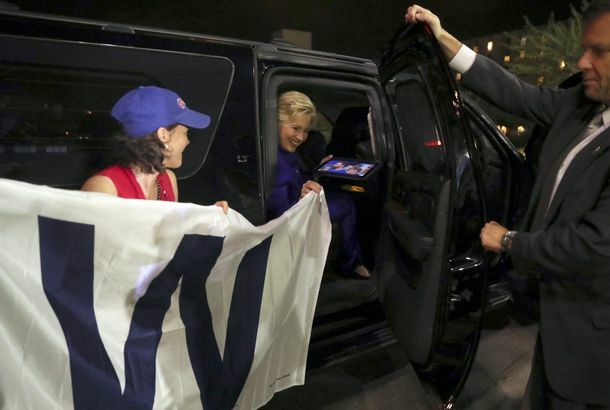 GOP Oppo Dump: Hillary Clinton Is Not a Real Cubs FanA swing and a miss. World Series Now Guaranteed to End Pain for at Least One Long-Suffering Fan BaseThe two baseball teams with the longest active championship droughts will battle for deliverance starting Tuesday. The Indians Are Going to the World Series and There’s Only One Thing Left to DoFormer Yankee Andrew Miller is the ALCS MVP. The Mets and Cubs Are League Favorites. Could This Possibly Be Real?It’s opening day and the Mets and Cubs are league favorites, hard as that is to believe. Matt Harvey Has the Spotlight All to Himself, One More TimeIt was inevitable that this is where Harvey and the Mets would end up: with everyone watching and everything on the line. The Most Costly Error in World Series History?Some biased, somewhat depressed postgame thoughts. Was Game 3 a World Series Turning Point?Some proudly-biased postgame thoughts. Is It Over for the Mets?An unapologetically biased postgame debriefing. Honestly, What Was Céspedes Doing on That Homer?A morning-after World Series debriefing. Fox Loses World Series Feed in Middle of Game 1You had one job, Fox broadcast truck. See Dave Eggers’s Cartoon Reportage of the World SeriesFor Game 1 at AT&T Park: Texas Rangers vs. the San Francisco Giants. Jay-Z and Alicia Keys Want to Hear It for New York, New York, New YorkWas it just us, or did we hear a smattering of boos? New York Post Libels Philly Food SceneIn which Gotham’s paper of ill repute dares to malign not only the Philly Phanatic, but misrepresents our pretzels! Carnegie Deli Will Bring Cheesecake to Pennsylvanians Regardless of the SeriesThe landmark deli is opening an outpost in a Pennsylvania casino.